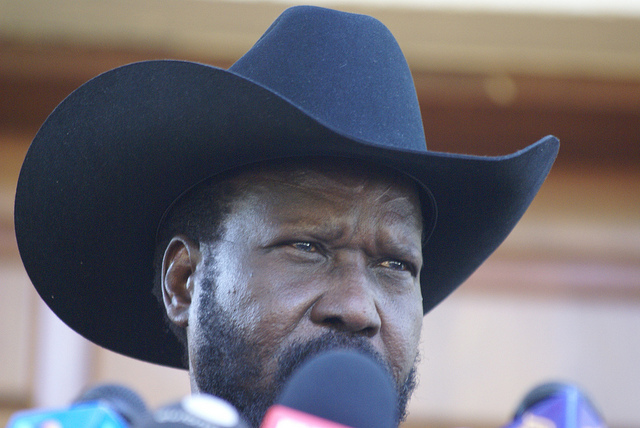 South Sudan President Salva Kiir has called upon security forces in the country to stop robbing and killing civilians. Reports of police officers and soldiers killing civilians and looting their homes have been a regular feature of South Sudan’s ongoing civil war and Kiir has come under criticism for not doing more to guarantee the safety of people in the country. Speaking at a police conference in Juba on Thursday, Salva Kiir called out the nation’s security forces over the ongoing atrocities taking place in South Sudan. “Shame on you,” he said to an audience of police officers and officials. “You are the custodians of the law. Kiir’s comments come as the United Nations moves additional troops to the Unity region to protect civilians from clashes between government troops and rebel forces. Tens of thousands of people have been killed in South Sudan’s civil war and civilians are often targeted by fighters on both sides of the conflict. Reports of security forces and rebels killing civilians, looting their homes and sexually assaulting women continue to emerge and these horrific human rights abuses go unpunished. More than 4 million people have been forced from their homes to escape violence in South Sudan. Over the past year, there has been a surge of armed robberies and killings in the capital of Juba and witnesses consistently accuse soldiers and police officers of being responsible.